Dementia Awareness Week 2017 is next week, from 28th May to 4th June. To mark the occasion and to raise awareness of dementia, DCV will be holding a series of events and activities. 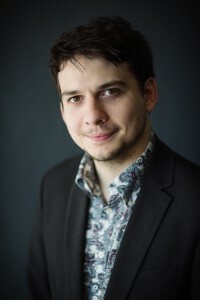 Dementia Carer Voices’ Project Engagement Lead, Tommy Whitelaw, will be holding a series of talks in conjunction with NHS Western Isles from 1st June to 3rd June. The talks will coincide with Dementia Awareness Week 2017 and are aimed at raising awareness for people with dementia and their carers. We will be running daily posts about Tommy’s tour. You can keep updated on the tour and see all the details of Tommy’s talks and events on our blog. 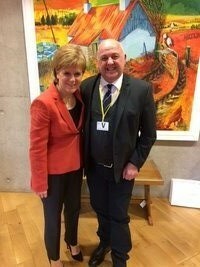 Dementia Carer Voices Project Engagement Lead, Tommy Whitelaw, met with the First Minister, Nicola Sturgeon, in the Scottish Parliament on the 26th April. It was a great honour and an opportunity to discuss the DCV project and share the story of the people we’ve met and pledges we’ve received. 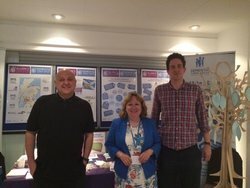 On the 10th May, ALLIANCE Director, Irene Oldfather, Project Engagement Lead, Tommy Whitelaw and Policy and Information Intern William Griffiths attended Focus on Dementia’s conference at the Crowne Plaza Hotel in Glasgow. Tommy and William manned our stand and engaged with lots of people about the work of Dementia Carer Voices and the ALLIANCE. We were visited there by, among many others, Tom McCarthy from Health Improvement Scotland and the team from Hatton Lea Care Home that Tommy visited last month. 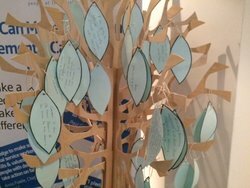 We brought the DCV pledge tree on which people wrote reflections about what caring a person with dementia means to them. Please see the blog for some of the inspiring pledges we received on the day. Irene spoke at the ‘on the couch’ session about the importance of person centred care, and shared some reflections on what barriers carers face in providing high quality care. It was a good day, and great to meet many unpaid carers, people with dementia and policy professionals on the day. Take some time to read the inspiring pledges here. British Society of Gerontology Scotland Networking Seminar are organising a conference at Glasgow Caledonian University 12.00 – 16.30 Wednesday 14th June, 2017. The conference will discuss: Are we ready to integrate health and social care? This month one of our guest blogs came from Gregory Hill-O`Connor, Our Voice Co-ordinator at the Alliance. Greg tells us about his visit to Glasgow Housing Association and What Matters to You Day. 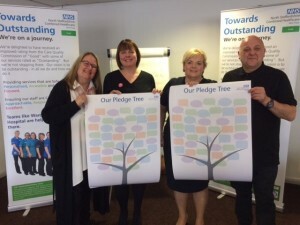 A big thank you to Maria Nelligan @Nell1Maria – Director of Nursing and Quality, Julie Anne Murray @JulieAnneM2016, Colin Burgess @StaffsOatcakes and all at @CombinedNHS Trust for inviting Tommy to speak at their Annual Conference and help launch initially 25 what matters to you pledge trees across all areas of the trust and community. Maria and Julie Anne helped support 4 talks at Keele University with Tommy and Colin and invited Tommy to speak at the trust conference. The day was truly inspiring. We are looking forward to watching the trees grow and to returning later this year to meet the teams again, to capture the story of pledges, what matters to staff and what matters to people across the trust areas. After the morning sessions, the conference broke out to a safari quick fire 15 minutes sessions, sharing ideas then moving on to the next table. Thanks to David Reddy, Admin and Clerical Support Officer the Association of Non-Medical Prescribers for kindly inviting Tommy to speak at their Annual Conference at the AJ Bell Stadium in Salford on April 25th 2017. Also, a big thanks to Dr Debbie Robertson, of Chester University, to suggest Tommy as one of the speakers. Over 200 delegates from across the North West attended and made personal pledges that you can read below. 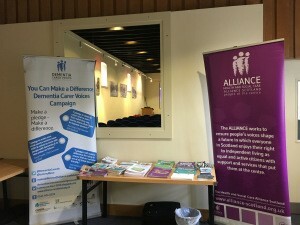 We will also be showing a poster displaying our work at the Alzheimer’s Scotland and NHS Scotland Conferences. There are many ways to connect with Dementia Carer Voices. Last month we launched our Facebook page, we can be reached on Twitter or through email at dementiacarervoices@alliance-scotland.org.uk. Do get in touch with any questions about our upcoming talks or events, if you want to share a blog with us or just to say hi. What Matter To You day is on the 6th June this year. Find out more information over on the #wmty17 website and see how you can get involved, how to order free resources and what activities will be taking place. The ‘What matters to you?’ team have been redeveloping the resources, and are pleased to let you know that these are now available. Dementia Carer Voices also has What Matters to You Case Studies live on our blog. DCV’s colleagues at The Health and Social Care Academy are running their third annual Creative Competition. This year’s theme is on change and they are partnering with Scottish Recovery Network, Write to Recovery, Reachout with Arts in Mind and Mind Waves. What you need think needs to change in Scotland to keep us living well? What you do to stay healthy and well? What one thing you would change where you live to keep you well? There are five categories; poetry, short story, film, photography and arts and crafts and the competition will run till Wednesday 19th July. This year’s partnership with Write to Recovery means that entrants to the poetry and short story category can upload their submission direct to the Write to Recovery site.